Plasma Ignition System consists of plasma igniter, power source and double ended shielded high voltage cable. 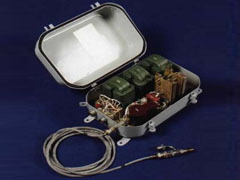 Depending on application and customer needs APT provides either thermal or non-thermal plasma igniters. Thermal plasma igniter, which is the best for ignition purposes, has flexible design to meet specific customer requirements and usually replaces existing igniters and spark plugs. For plasma formation it could utilize air with pressure from 200-500 Pa to 15,000 Pa (20 to 1,500 mm of H2O). That is equivalent to pressure differential on a combustion chamber wall at a starting period. It means that no special air supply system will require. Igniter provides plasma torch with power from several hundred Watt to 1.5 kW, velocity up to 300 m/s and temperature from 1000 K to 5000 K. Power supplies may have different input voltages: 24-27 V DC; 110 V, 60 Hz AC; 220-240 V, 50 Hz AC and 380 V, 50 Hz AC, weight from 0.5 kg to 17 kg depending on output power and application. For information about non-thermal plasma igniter please visit Pilot Burner page. Future works – (1) igniters for high speed propulsion systems utilizing lightweight, high temperature composition ceramic with variable conductivity of the material layers, (2) pulsed RF and MW one electrode ignition systems with low power volumetric discharge for continuous operation in flare stacks, IC engines, high pressure combustors.